Facebook has released a poke app for the iPhone, which the company describes as a "fun and easy" way to "say hello to friends wherever you are." Of all the features Facebook possesses, one of the longest-serving is the poke feature, and what better way Facebook to accentuate its relevance than offer it its very own app. Of course, a poke app on its own sounds rather boring, and so Mark Zuckerberg and his team of developers have thrown in a bunch of other features to accompany the poking experience. Among them, is the ability to send a message, photo, or video to anybody on your approved list of Facebook friends. It is, for all intents and purposes, a less full-on version of the Messenger app, and if you find instant messaging to be a bit of a time-hog, the Poke app should slot into your life quite fittingly. The main difference between the Poke app and other such instant content-sharing apps, is that each message expires after a set amount of time – between 1, 3, 5 and 10 seconds. Once that set amount of time has passed, the message disappears from the app – never to be seen again. In order to see message sent from a friend, all you need to do is press and hold said message, and it will expire. Facebook has also added a handy reporting feature, in which users can flag content they find offensive. Facebook has dedicated a vast amount of time and resources into updating and improving its range of mobile apps, and it has to be said that, this year, it looks as though they’ve cracked it. Both the iPhone and Android apps run smoother than warm butter, and with several accompanying app focused on messaging, image sharing, and now poking, the Facebook experience on a mobile device is almost as feature-rich as on the desktop version. 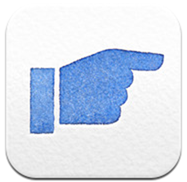 Like the other official offerings, Facebook Poke is free of charge, and you can download it right now via the link below.